Last week's episode of Doctor Who was the sweetest birthday gift that 2000 AD has received. Russell T. Davies crafted a brilliant little story simply packed with homages to our favorite comic. At one point, the Doctor, trapped in traffic in something a lot like the Hoop from Halo Jones, starts climbing down from flying car to flying car and meets a doppelganger of Max Normal, the Pinstripe Freak of Mega-City One. Add in little Who-world versions of Swifty Frisko (also from Halo Jones), the emotion-drugs from Harmony and the parliament of skeletons from Sooner or Later among others, and you've got a simply wonderful love letter, one which Davies talked up on the Doctor Who Confidential documentary that followed the episode. Only two writers have officially worked for both the world of Tharg and the televised Doctor Who, although many have worked on the ancillary merchandise and spinoff novels and audio plays. The first of these was Paul Cornell, who scripted the 2005 episode "Father's Day" and has another story coming up in a few weeks. Cornell was one of the first writers to work on Virgin's Doctor Who New Adventures, created Bernice Summerfield, one of the best companions ever, and later scripted some of the Doctor's comic adventures in DWM. 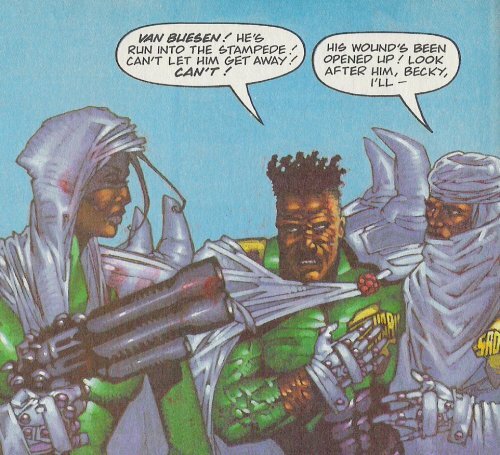 In 1994, he penned his first series for Judge Dredd Megazine. This was Pan-African Judges, which introduces the judges of central Africa. It's also the first art job for Tharg for Siku, the pen-name of British/Nigerian artist Ajibayo Akinsiku. The first series of Pan-African Judges has its moments, but unfortunately it also has, as its villain, a white South Efrican poacher. This surprises nobody. Cornell's next series, Deathwatch, followed in mid-1995. This was illustrated by Adrian Salmon and dealt with a Brit-Cit judge who's lost in time and ends up in Elizabethan England. His most recent series was 2003's terrific XTNCT, drawn by D'Israeli, in which six dinosaurs try to wipe out the last dozen or so humans on the planet. You need the collected edition of this like you need oxygen and a square meal. The only other writer to work for both the TV Who and the House of Tharg has been Andrew Cartmel, who was the script editor for three seasons in the 1980s. 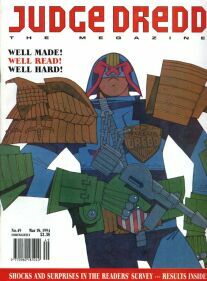 Unfortunately, Cartmel's handful of Dredd episodes in 1996 show him with much the same problem that the TV series saw during his watch: he's a great ideas man who has trouble executing them; his construction is awkward and abrupt, and scenes transition poorly. On the other hand, Halo Jones certainly inspired and informed more than one story during Cartmel's day; it was nice that he had the chance to contribute in some fashion. 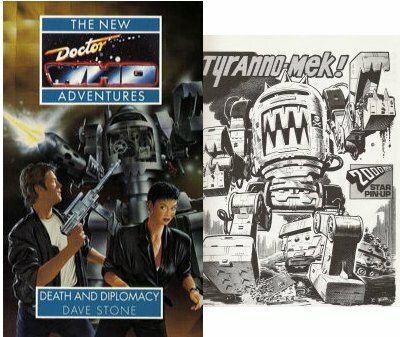 No getting around it; that is definitely Tyranno-Mek from Ro-Busters, as designed by Dave Gibbons. 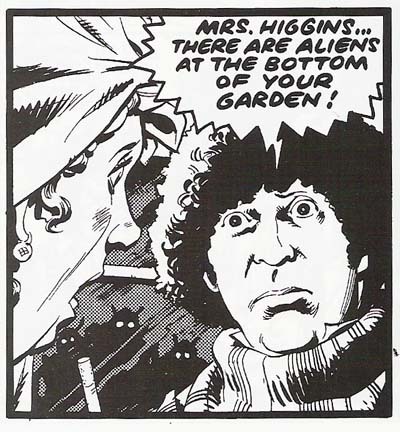 Of course, Gibbons is one of the many contributors to the Doctor Who comic strip. One of the best, and certainly the longest-running of all the varied Who spinoffs, the comic has featured work from many 2000 AD talents, including John Wagner, Pat Mills, Steve Moore, Steve Parkhouse, Mick Austin, John Ridgway, Alan McKenzie, Robin Smith and Grant Morrison. Pat Mills stayed in touch with the production office for some time. He had a four-part adventure in various stages of development throughout the Peter Davison era, before the producer and script editor finally turned it down in 1984. The story was called "Song of the Space Whale" and apparently concerned a community which had been swallowed by some giant space creature decades earlier. One rumor suggests that it was intended to be the story which introduced the character of Turlough. Frankly, I think Russell Davies is missing a trick by not going straight to the thrillpower source when looking for new talent. One of the major disappointments of series two was the by-the-numbers Cybermen story. Could you imagine how that might have turned out in Pat's hands? Or Gordon Rennie's? Or look at it the other way around: Steven Moffat's Who short stories and TV episodes have been innovative, original and creepy. Wouldn't you like to see him let loose on a 13-week serial in the Galaxy's Greatest?